Now we are looking at a stacked Philadelphia lineup. They were favorites to land Bryce Harper, and while it took longer than expected, it did happen. The Phillies did not stop there, adding Andrew McCutchen, Jean Segura, and J.T. Realmuto. There isn’t much speed in this bunch, but they have a great deal of power and on-base guys to make this offense a strong one. Rhys Hoskins will power up with Harper, as they have potential to smash 80 combined homers this season. With the names in front of Harper and Hoskins, this offense has potential to end up top five when the season is finished. Even moving into the back half of their lineup, names like Odubel Herrera and Maikel Franco are no slouches. Sit back and watch the fireworks go off in Philly. Philadelphia is in the midst of trying to add a couple of pieces to really send a message to the rest of the National League. They have mainly been doing it with the bats, so they are going to rely on the same rotation from last season to get them over that hump. This starts with Aaron Nola, who is coming off a fantastic full season. He has emerged as one of the more dominant right-handers in baseball. Nola had over 220 strikeouts last season, and pitched over 200 innings. This was promising after a few early career injuries. Nola is expected to jump back a full run in the ERA department, but that is somewhat expected given how rare to have under a three ERA is these days. Everything else lines up as expected. Jake Arrieta was a bit of a wild card last season, mainly because he relied so much on batted ball luck at times. He is now a heavy sinker ball pitcher, and has gotten away from striking guys out. He had 138 strikeouts in 172 innings, and strikeout projections are pedestrian for him once again. We likely will never see prime Arrieta again, but he can be a good pitch to contact arm. The Phillies might have one of the higher upside rotations in terms of backend guys. 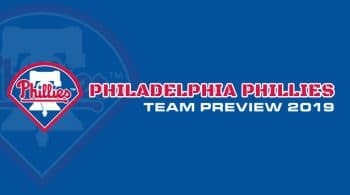 There are a lot of adjustments being made for Vince Velasquez, Nick Pivetta, and Zach Eflin. They have one very good off-speed pitch, and above average velocity numbers on their fastballs. These are two things that can start to lead to success. Pivetta and Eflin had awful early career numbers, but are starting to make a wave now. Velasquez has always flashed potential, but consistency has been the issue. All three sat with above average strikeout stuff last season, but the walks and blowup innings were there. Projections have Velasquez and Pivetta making another jump, but sample sizes might just be too small for Eflin’s success last season. Philadelphia might be in the mark to add a name come the deadline, especially with an injury or the backend not working out as advertised.